Dates/times/facilities arranged on individual basis. Contact info below. Please visit and support "The Cage" located at 62-40 Metropolitan Ave in Middle Village, Queens. The Cage is New York's newest, and most prestigous indoor baseball training facility. They feature 6 MLB regulation and 2 little league length hitting cages, all with state of the art pitching machines, movable pitching mounds, and pitching screens. The Cage is a sponsor and supporter of RGMVM league. The Cage also features a huge cage where teams can practice fielding and other baseball related drills. The video games along with the large seating area make The Cage the ideal facility to hold a birthday party for your child as well. For more information about using the facility for your team, or if you would like to throw a birthday party for your child, you can contact Judy, Ross, Evan, or anyone of The Cage's friendly staff at (718) 366-2122 or visit them on the web at www.thecagenyc.com. Former professional RGMVM Star Player is currently giving pitching lessons. Greg also has a new web site: www.modicapitching.com. He started the year in Spring Training with the Milwaukee Brewers. Although he was released at the end of camp he went back to play with the River City Rascals of the Independent Frontier League. In his second campaign with River City, Modica posted an 11-3 record while being selected to the league all-star game for the second straight season. Not ready to shut it down, Modica was signed for the final ten days of the season by the Somerset Patriots of the Atlantic League. In his Patriot debut, Modica shined carrying a no-hitter into the seventh inning against the first place Nashua Pride. He finished the game with seven scoreless innings, one hit, one walk, and nine strikeouts. Modica would get one more start on the final day of the season. He won again giving him a 2-0 record in the Atlantic League and a 13-3 overall record for the year. In Somerset Modica had the chance to play for former Yankee standout and 1977 Cy Young Sparkey Lyle. Modica originally signed by the San Diego Padres in 2001, spent two seasons in their organization. After getting released following the 2002 season, Modica went to the Independent Leagues and landed in River City. He was an all-star there in his first season. Greg finished his pro career with the Long Island Ducks. Of The St. Johns Red Storm baseball team. Home Grown RGMVM Star Goes Back To His Roots And Gives Back.. Although it may seem to be worlds away from his Glendale roots, the stadiums in the Atlantic League are right in Greg Modicas backyard. At 511, 150 pounds, the undersized right-handed pitcher just completed his fifth season of professional baseball winning a championship with the Somerset Patriots in the Atlantic League. A product of the RGMVM Little League, Modica was playing on many of the same diamonds that local little leaguers are still playing on today. He used the fundamentals learned on these fields as he attended Archbishop Molloy High School. Modica never starred at Molloy, nor did he play very much but his persistence would pay dividends in the future. After his Molloy team won the city championship in 1998, he left the city life behind for a chance to play baseball at a small university, Culver-Stockton College, in Missouri. Modica began to make a name for himself in the Midwest. In his freshman season, his school went to the NAIA World Series where they finished 3rd in the nation. Greg not only pitched a win in the series, but was also named to the All Conference team as well. Never known for a blazing fastball, he began receiving lots of attention his junior season when scouts started seeing radar gun readings over 90 miles per hour. Soon Modica was pitching to an audience of scouts every game and signed with the San Diego Padres shortly after the Major League Baseball Draft in 2001. In his two seasons with the Padres, Modica never advanced out of A-ball and didnt put up the greatest numbers. It was a tough adjustment to pro baseball but that didnt stop him from playing. He continued his career in the independent Frontier League where he was an all-star for both his seasons before coming to the Atlantic League this season. While in the Atlantic League this season, Modica worked with many ex-major league pitchers including Brian Tolberg who spent 3 seasons in the majors with San Diego and Brad Clonz who was a part of the Atlanta Braves championship team in 1995. Nothing has been easy, Modica said. You take everything in stride and learn from your experiences. You try to improve every season and hope that the failures of the past lead to success in the future. They just might be. Modica threw game one of the Championship Series. He went 7 innings for the victory, helping manager, former Yankee Cy Young Award winner, Sparky Lyle capture his third title with the Patriots. Modica, unsure of how much longer his baseball career will last or even how far he will make it, has been preparing for the future. He has been taking his time to help others for the last 4 years. He stayed and coached at his college in Missouri for two years and now has been giving lessons at Batter Up in Howard Beach for now his second year. Modica will be offering a free pitching seminar to local little leaguers ages 9 to 13 on December 3rd at Batter Up (162-87 Crossbay Blvd) at 10am. It is good to try and give back to the community. Ive had a chance to work with a lot of people in baseball. From talking with Trevor Hoffman, to becoming good friends with Major League journeyman Carlos Reyes, and all the other players and coaches I have worked with, I have tried to be like a sponge and take in information from everybody. If I cant make it to the Major Leagues, maybe I can help somebody else get there. Anyone interested in attending the seminar should contact Batter Up at (718) 738-4487. Velocity Sports Performance is a new sponsor where you can train to get faster, gain more agility and core strength. Learn first-step power and acceleration, Multi-Directional (lateral speed & agility) and Maximum Velocity (form, technique and mechanics running for once an athlete has reached top speed). St Johns Red Storm who took time out from his busy schedule to come down and conduct the clinic. Also attached is the Ed Blankmeyer St. Johns 2006 camp information. finest run baseball learning and teaching experiences around. Coach Blankmeyer's camps and clinics are a must if are looking to help you kid learn the game of baseball the correct way. Instruction will take place at St. Johns University ½ hour lessons, 45 min. lessons, or 1-hour lessons Ages 8-16 (boys or girls) Please call me @ 917-902-5189 for details Email: mfahid2@hotmail.com. WHICH BAT OR GLOVE SHOULD I GET MY KID? 1. (VERY IMPORTANT) Have a lesson plan for each practice that you hold. 2. Before practice, be sure to properly stretch for 10 minutes. 3. Start by having each child warm up there arms for about 5 minutes. 4. Split the group up into outfielder's and infielder's. Providing you have two coaches then run drills for infielders and outfielders cover something different each time. Do this for 15 minutes and then switch the kids. 6. Always incorporate base running drills at the end of each practice, the kids are full of energy so let them run, and there parents will thank you because when they get home they will be nice and tired. It seems like such a simple question, however, like most things in baseball, there is a little more to it than meets the eye. At Clutch Hitting, our goal is to simply give children the best probability of succeeding by teaching them fundamental concepts that are based on sound logic. That is to say we do not teach children the style of hitting we used to hit with or the style we like the most. What we do try teach, however, is sound logical (i.e. fundamental) steps which lend themselves to reasoned explanations that are hopefully easy to understand and progressively reinforce through practice. This all starts with where a batter stands in the batter's box. Baseball is often called "a game of inches," but it can just as easily be called "a game of angles." Where a batter stands in the batter's box will undoubtedly affect the angles he creates for himself and whether a batted ball will be fair or foul. 1. First, take note that the foul lines go out from the back corner of home plate. (1) These lines represent the angles a batter must work with. Although we will use the batter's box as an obvious reference point, it is really irrelevant to where a batter stands. Little League Note - Major League ballplayers stand where they do because of particular strategies that they have chosen to incorporate. They know their swing and what they give up based on where they stand. In short, DO NOT COPY A MAJOR LEAGUE PLAYER'S APPROACH UNLESS YOU ARE SURE YOU UNDERSTAND WHAT THEY DOING! And unfortunately, probably the only way to know is by speaking with them. 4. Next, the batter should place his front foot/toe against the handle/knob of the bat (4) and then spread his legs for his stance by moving his back foot only. Little League Note - This may seem simplistic, but Bernie Williams, the All-Star Centerfielder for the New York Yankees, and the 1998 American League Batting Champion, does this each time he steps up to the plate. In fact, he takes this basic approach one step further, and draws a straight line in the batter's box so that he is sure to stand square to the plate. (see Tip "The Stride"). 5. But how far apart should the legs be? 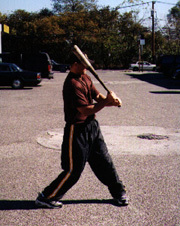 The appropriate width of a batter's stance is normally equivalent to the size of the bat he is using. Therefore, a good rule to follow is to perform Step 4, and then place the bat down, one end at the front foot, the other at the back part of the batter's box. (5) Then, a batter can simply spread his legs the length of the bat. 6. Why is this so important? a. First, for the simple reason that it makes sure that the batter has full plate coverage. c. And, as we stated at the very beginning, it creates the proper angles. It would be unfortunate for a batter to take a swing, doing everything correctly, even having perfect timing, only to produce a foul ball! Again, it is "a game of angles." d. Moreover, notice that the further towards the front of the batter's box a batter stands, the closer he is to the pitcher, thus the earlier he must decide whether the pitch is a strike or not. (7) That is, pitches that may fall out of the strike zone, (i.e. breaking pitches), now appear to be strikes because either they have not finished their break or are just about to break. Therefore, not only does a batter give up time to decide whether or not the pitch is a strike and throw off the angles, he also enlarges the strike zone when standing "up in the box." e. When a batter stands "back in the box," (8) true, he does give himself more time to decide whether to swing and obviously more time to hit the ball as he has moved away from the pitcher. Unfortunately, however, he has also given the pitch more time to move. That is, the batter will lose the ability to hit breaking pitches before they break (i.e. while they are still "hanging" and may also swing at pitches as they are "leaving" or moving out of the strike zone instead of entering it). Since it seems that too far "up front" in the box causes just the opposite problems as standing "back in" the box, it may seem that we are advocating simply standing in the middle. If that were true, other coaches may logic that each batter should stand in the appropriate place in the box dependent on his strengths as well as what pitch he expects. And that is precisely what leads to the problems described above. At Clutch Hitting, as we state with many of our Tips, they are designed to simply give ballplayers the best overall probability of success without taking short cuts. As such, standing consistent with the angles of the field as described above is the most productive compromise for ALL HITTERS in order to be able to hit all types of pitches as well as hit them fair. Haven't we all been told at one time or another to stride or take a step into the ball during our swing? Your little league coach probably told you that that was the way to get your weight into the ball and achieve some power. Well, guess what? That is the exact way to lose most of your power. You see, most of your power is produced by your lower body, and if your weight is transferred too quickly, as most hitters do, your power has been exhausted before it can be properly utilized. First you must understand that hitting a baseball has a great deal to do with leverage and keeping your head in one spot, or at the very least, on one plane throughout your swing. Therefore, Clutch Hitting encourages its students to practice a stride or a step which achieves the utmost leverage and at the same time promotes a swing which keeps the batter's head in the same spot throughout the swing. Questions or clarification: E-mail us and we would be glad to explain in greater detail or supply you with one of our basic hitting fundamentals manuals. Bonus Hint: A different way to practice "Up against the Wall"
Stand in front of a mirror in your batting stance. Pay attention to where your nose or eyes are located in the mirror, and place a piece of tape on the spot. Now, take your batting stance again, your nose or eyes should not be visible because of the tape. Then, take your step/stride and if you can then see your nose or eyes then you are coming off the wall and transferring too much weight. Then, repeat the whole process and add your swing, your eyes/nose should still be behind the tape. 1. Take your batting stance with your back shoulder pressed up against a wall. Your back foot should be lined up directly under your shoulder and your back knee as illustrated. (Yes, this might necessitate lowering your back elbow for the time being, but don't worry, we will get to whether your little league coach was right when he or she told you to "keep your back elbow up, so that you swing level" in future "Tips of the Month"). 2. You should also have your weight distributed about 70 - 30 with most of your weight on your back foot. To help achieve this distribution, you may want to bend your back knee just a bit. 3. Now, you should attempt to take a small stride with your front foot stepping towards the pitcher without allowing your back shoulder to come off the wall. At Clutch Hitting, we like to say "it's like stepping on thin ice." That is, your stride should be a soft stride which does not offset your weight distribution. In this position, a batter is now prepared to hit. A batter does not stride at the same time that he or she swings. The stride merely prepares a batter to hit. 4. If your shoulder comes off the wall, you have taken too big of a stride. That is, the ball is being pitched towards the batter on a particular plane (and actually changes planes depending on what type of pitch). A batter, by striding too far actually changes the plane that his or her head is on, thereby making the ball appear to move slightly. This usually results in a batter hitting the bottom of the ball because the eyes and head have moved down a plane and as a result they are no longer swinging at the part of the ball at which they were aiming. 5. There is no right way to assume the stance, however, the concept of not transferring your weight too far or too soon is fundamental to any discipline of hitting. 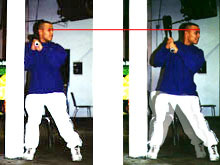 As shown above and below, a batter may achieve a solid "up against the wall" stance in a variety of ways. but each lesson took someone with more common sense than I to point it out. This week's thoughts are based on the great team-style of play of the 2002 World Champion Anaheim Angels and their great coaching staff. The batting average is the 'Satan' of hitters! Why? and that's when you should look at your numbers! I learned this from Steve Springer, author of one of my favorite tools; an audio CD called Quality at Bats...the mental side of hitting! You can't live forever nibbling on the corners. Pitching aggressively is the ultimate sign of a pitcher with potential and/or one who will experience continual success (and sometimes Barry Bonds takes you downtown too). Develop and play for the big inning. because in 65 percent of all wins, the winning team scores more in one inning than the losing team scores during the entire game! You just can't count on scoring in every inning....see game 6 when the Angels were down by 5 runs and trailing the series by 3 games to 2! but each lesson took someone with more common sense than I to point it out. Develop and play for the big inning. Why? Because in 65% of all wins, the winning team scores more in one inning than the losing team scores during the entire game! You just cant count on scoring in every inning. The change up is the 2nd pitch a pitcher should add to his arsenal. Why? Because successful pitching is the destruction of a hitters timing. VISIT THIS GREAT WEB SITE FOR GREAT COACHING TIPS!! GREAT FOR PARENTS AS WELL AS COACHES !!! The 1st lesson a boy needs to be taught is how to love the game! This starts young and are the memories that keep them going through the inevitable hard times. How? Take him to Spring Training, to Cooperstown, to a High School game, play catch with him on Christmas day (even if it is out in the snow). Pitchers are made in the off season! Yes, this was in the last issue...it is that important and bears repeating! Long Toss, done properly, will do more to developing a strong, healthy arm than most anything else I know. JUNIOR BASEBALL is "America's Youth Baseball Magazine", the national dedicated publication for youth baseball players, their parents, coaches, and associated organizations, regardless of league, park, or school affiliation. Published by youth baseball participants and enthusiasts, we know the sport and what it means to you! The nation's top high school, college, and even Major League coaches contribute to JUNIOR BASEBALL, so the information you get here is from the experts who know the game best! JUNIOR BASEBALL MAGAZINE is the authority on youth baseball, and is officially endorsed by the National Baseball Hall of Fame, Pony League, Babe Ruth League, British Baseball Federation, Dixie Youth Baseball, Amateur Athletic Union (AAU), American Amateur Baseball Congress (AABC), Continental Amateur Baseball Association (CABA), Dizzy Dean Baseball, National Amateur Baseball Federation (NABF), National Baseball Congress (NBC) 'Hap Dumont', National Association of Police Athletic Leagues (PAL), United States Specialty Sports Association (USSSA), United States Amateur Baseball Association (USABA), and USA Baseball. JUNIOR BASEBALL is an independent publication and is not affiliated with any youth baseball organization, but covers all youth baseball programs including Little League, PONY League, Babe Ruth League, Dixie Youth Baseball, Dizzy Dean Baseball, T-ball, AAU, CABA, AABC, PAL, USABA, USSSA, NABF, high school baseball, parks & recreation programs, YMCA youth sports, American Legion Baseball, and all other youth baseball organizations, divisions, leagues, tournaments, etc., including select baseball, travel teams, and club ball. This website provides a sampling of the excellent editorial found in every issue of JUNIOR BASEBALL MAGAZINE as well as additional information not found in the printed version. You'll also find on this website youth baseball camps and schools, and a youth baseball tournament calendar. Listings are free and may be sent to: editor@juniorbaseball.com or faxed to: 818/710-1877. On our site you'll find the Junior Baseball Store - a great source of baseball books and videos covering all topics of coaching, skills building, pitching, hitting, fielding, running, and more! Also, browse our back issues of JUNIOR BASEBALL MAGAZINE, and pick out some issues with articles of particular interest to you. You can also subscribe to JUNIOR BASEBALL MAGAZINE, and have each big, colorful, exciting issue delivered right to your mailbox! If you're in a baseball-related business, and would like to reach kids, their parents, and coaches involved in youth baseball nationwide, contact us directly for advertising information. Like to share your baseball knowledge or experiences with our readers? We are always looking for good writers to submit articles on a variety of topics and styles. See our Writers' Guidelines for more information. We are always interested in your comments and suggestions. You can contact us in a number of ways, and we encourage you to do so! It is JUNIOR BASEBALL MAGAZINE's mission to provide information that enhances the youth baseball experience for the entire family. The player improves his skills and is more successful. The family enjoys the activity more and shares this precious time in their life. 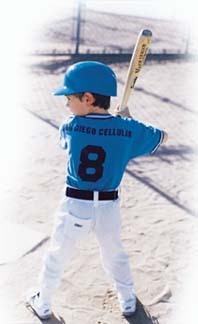 JUNIOR BASEBALL emphasizes good sportsmanship, safety, physical fitness and wholesome family values. Whether it's information on pitching, hitting, catching, fielding, base running, or all other aspects of the game of baseball, we strive to present the most accurate information, from the top baseball coaches and experts, in the easiest-to-understand format possible. If it has anything to do with youth baseball, you will find it in JUNIOR BASEBALL MAGAZINE! JUNIOR BASEBALL MAGAZINE targets all youth players ages 7-17, their parents and coaches. However, most articles are geared to the 10-14 year-old experience. 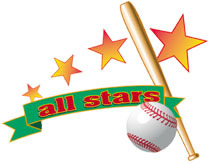 There are articles in every issue for parents, a regular tee-ball level column (Rookie Club) for ages 5-8, a column for more experienced players ages 9-13 (All Stars), and a department for high-school age players 14 -18 years-old (Hot Prospects). Many parents of younger children choose articles to read out loud to their kids. In fact, JUNIOR BASEBALL is actually edited on three different reading levels, so there's something here for everyone! The magazine's top quality editorial entertains, challenges and makes reading fun. By improving both their playing and reading skills, JUNIOR BASEBALL helps players prepare for a better future. JUNIOR BASEBALL is used by teachers and librarians nationwide. Special group subscription rates are available for school and municipal libraries. JUNIOR BASEBALL MAGAZINE helps parents save time and money by reviewing the latest youth baseball equipment (bats, gloves, mitts, pitching machines, training aids, etc. ), evaluating performance and value and providing the best sources for training devices, books and videos. Twice a year, informative Buyer's Guides are published. Families turn to JUNIOR BASEBALL MAGAZINE to help them make many of their buying decisions. There's Much More You're Missing! The articles on this website are just a sampling of the many popular features, in-depth skills clinics, columns and departments as well as sweepstakes and give-away promotions that will only be found in the exciting, full-color, printed magazine version of JUNIOR BASEBALL! Published bi-monthly, JUNIOR BASEBALL MAGAZINE is available by subscription and on select newsstands, independent locations, and leading bookstores nationwide. Subscription phone lines are open M-F, 9AM-5PM, Pacific Standard Time. Recorded messages and orders can be left 24 hours a day. Discounted group subscription rates are now available for leagues, coach training and certification programs, and associations. Please call or email for details. A portion of your subscription dollars helps make this website service available free of charge to all youth baseball participants. You already have learned some basic lessons on hitting, such as how to choose the right bat and how to properly set up in the batter's box. In this lesson, I will help you to correct hitting mistakes that a lot of kids make. Look at the player in the two photos on this page. 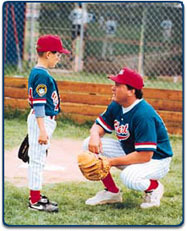 If you think about what you have learned so far, you can tell that the boy is correctly set up in the batter's box. He also has a bat that is the right size for him. But look closely. In one picture, he is holding the bat almost straight up. In the other picture, the bat is almost flat and sitting on his shoulder. When the pitch comes, which one of those bat positions will help the boy to hit the ball far? If you picked the picture where the boy is holding his bat pointing upward, you're right. 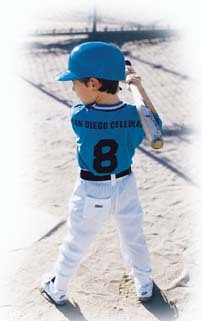 In that position, the boy will have a faster swing and he will be able to pull the ball to left field. The way you hold your bat - straight up, slightly tipped, or flat - creates an "angle". Making the correct angle with your bat is an important part of "bat speed". To be a good hitter, you must have bat speed! If you hold your bat flat or down, you will have a slower swing. The wrong angle makes it hard for you to create a fast bat speed. Here is a great way to find out for yourself about bat speed: Set yourself up in your batting stance and hold the bat flat, like the boy in the picture to the right. Take one hand off the bat. Close your eyes and think about how heavy the bat feels. Keep your eyes closed, and have a parent or coach raise the angle of the bat until it is straight up (see boy on left). Does the bat feel heavier, the same, or lighter than it did before? I'm pretty sure you will say "lighter". This means you will be able to swing the bat more quickly, and you will have a faster bat speed. Remember this lesson when you are playing baseball, and you will soon become a better hitter! One of the very first things I tried to teach our son, Zachary, whos now a starting pitcher for his high school team as a sophomore, was that even a Hall-of-Famer isnt going to always have his best stuff. I told him that, on the average, one of every four times he walks out there hes going to have to try to survive on his wits, because for whatever reason, the skills just wont be there. Proof lies in his recent winter baseball experience, which lasted a total of four games. During the first three outings he struck out fourteen kids in a total of six innings of work. He was feeling pretty good about himself, as he took the mound for the fourth start. Then the wheels fell off the cart. Afterward, I sat him down in the bleachers and tried to walk through some individual pitch selections he had made, but mostly to remind him of the story hed been told all those many seasons ago. He listened. And eventually felt better about his future, if not his current performance. What do you do when the fastballs not moving, the curveballs flat and the change-up takes about four bounces on the way to home plate? The answer, in a word, is Simplify. Unless there is an injury involved, problems for a pitcher almost always are a matter of good mechanics temporarily gone bad. Keep in mind that, as weve said before, there are four parts to the pitching motion, and even a small breakdown in any one of them, leads to problems the rest of the way through. If, for example, youre having problems with your balance following the step-back, the first part of the motion, then start pitching from the stretch. This gives you a better chance of reaching your balance point, which is the second part of the motion. If youre having problems with your control, make sure your plant foot is facing home plate on the landing and that its landing in the same place, every time. Thats the third part of the pitching motion. Then make sure your follow-through is throwing-hand-to-opposite-knee. Thats the fourth part. Most of all, just slow down. Take your time. Dont try to throw every pitch perfectly. Just try to throw one strike at a time, and let your teammates do the rest of the work for you. And then go out and get them with your best stuff the next three times. The most important zone to learn to hit is the outside zone. Three quarters of pitches that a hitter sees are on the outside part of the plate or off the plate away. Most breaking balls and change ups are away from the hitter. Every hitter should concentrate on the outside pitch! The contact point for the hitter on an outside pitch is much closer to the catcher, or deeper over the plate, than the other pitches. Contact for the low-and-away pitch is opposite the back knee. The middle-away pitch is contacted opposite the mid-line of our body. The up-and-away zone is met even with our front shoulder. The lower the pitch, the deeper you let it get. The more the pitch is away, the deeper you let it get; more so than based on the pitchs height. If the hitter gets too far out front, the angle of the bat causes the outside pitch to be pulled. Unless the hitter is very strong physically, he ends up pulling many weak ground balls and fly balls to the left side. Hitting the outside pitch out front means the hitter has expended most of his power by the time contact is made. Hitting the ball deeper in the zone enables the hitter to drive the ball toward the opposite field. The bat is angled toward the opposite field when contact is made at the proper point. When contact is made the hands are ahead of the barrel. The low-and-away pitch has the bat angle of approximately a 45-degree angle to the ground. The middle-away pitch has the bat horizontal to the ground. The up and away zone is contacted with the barrel about 15 degrees above the hands. Most hitters stride at about the point of release from the pitcher. They do this because they have no idea what type or speed the pitch is at that point. 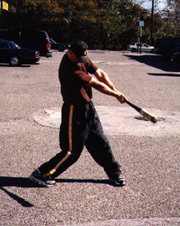 When the hitter strides, the weight is transferred to the back foot. To compensate for slower pitches (curve ball, change up) there is a pause or separation between the stride and swing. Otherwise, the hitter has completed his swing and here comes the change up! There is a longer pause or separation on pitches that are outside or low, because they are hit deeper in the zone and have to travel farther. To keep from pulling off the outside pitch, the hitter has to stay closed in the front side. When the front hip, shoulder, and then the head pulls off the ball, chances of hitting it solidly are remote. The hitter either pulls the outside pitch, hits it off the end, or swings and misses. A good coaching point when teaching hitters is to get them to stride toward the opposite middle infielder with a closed front toe. The right-handed hitter strides toward the second baseman. If the hitter strides with an open front toe, toward the pitcher, or in the bucket, the front side of the body opens up too early. This toe-to-instep stride not only helps on pitches away, but also keeps the head on the ball longer. The low pitch and outside pitch are the leastwatched zones because they are farther from the eyes. The back hip is the important hip when hitting the outside pitch. The front hip stays closed. Then the hitter really pops the back hip into the outside pitch. Driving the back hip into the ball provides the power to drive the ball hard to the opposite field. Every swing starts inside out. This means the arms do not extend too early behind the hitter. Getting outside or around the ball makes the hitter pull the outside pitch. Staying inside the ball allows the hitter to drive the ball to the opposite field. At the point of contact on the outside pitch the arms are extended. Mentally every hitter looks for the outside pitch first. If you start to look for the inside pitch initially, you open up too early in the front side. Look away first, where you stay closed in the front hip, shoulder and the head/eyes stay on the ball. Then if the ball stays inside you can adjust to the pitch and turn on it if you are quick. Look ouside-in but swing inside-out! Hitting is all about timing, and pitching is all about upsetting that timing. But how, as a hitter, can you upset the pitcher's timing? Take control of the 'tempo' of your at-bat. You'll notice a lot of college and major league hitters take what seems a long time to get into the batter's box and get set. They look at their third base coach, step in, step out again, adjust their batting gloves, take a practice swing, step in....sometimes call for time and step out again. When you slow down the pace of your at-bat, you accomplish a number of things.You give yourself more time to think about the situation, the count, the runners on base, where the fielders are positioned, etc. You can focus more on your task, and get relaxed. You can hit on your own terms and shift the advantage to yourself. Also, when you slow things down, you take control of when the pitcher actually pitches the ball. 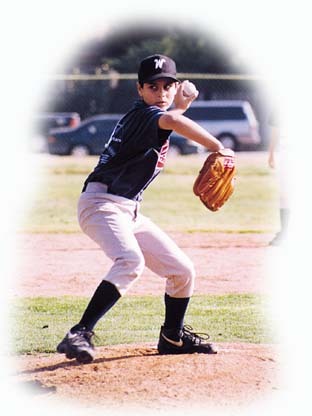 A pitcher who is 'on' that particular day is enjoying his success as well as a sense of control over the proceedings. You can steal a little of that control from him by stepping out, and with it, some of his confidence and his timing. When a pitcher gets ahead of you in the count, don't immediately jump back in there to allow him to keep his momentum going. Step out, make him wait, survey the field, Think about what you need to do next. When the other team has just made a great play on the previous batter, or turned a double-play, they're pumped up and on their toes, ready to make you their next victim. This is an ideal time to slow things down, to allow some of that momentum they just built up to drain away. Conversely, if the pitcher is struggling, and can't seem to throw strikes, stay in the box and get set to hit immediately. He'll more than likely rush his next pitch, Or, if the defense just booted a ball on the previous hitter (or flubbed a foul ball you hit), get back in right away to exploit their deflated confidence. When you are slowing things down, be subtle about it, and don't get the umpire angry with you. If you're too obvious, he'll order you back in the box, and not let you take your time again during that at-bat. A smart umpire will know exactly what you're up to, but if you don't make him look foolish, he'll let you work your strategy to your benefit. Junior Baseball Magazine On-Line Weve talked about how to throw different kinds of fastballs and both the traditional and safe curveball grips, too. The bottom line principle for young pitchers is to stick with the fastball until youve mastered it to the point where you can throw it for a strike, no matter the situation. But when the time comes to develop that second pitch, I suggest that it not be a curveball, but a change of pace, instead. For many pitchers your age, the curveball can be a pretty hard thing to throw for strikes. Even harder is developing the leverage needed to actually make the ball curve. The result often is a pitch that stays up in the strike zone. And curveballs that stay up are just another way of describing an extra-base hit waiting to happen. But a change-up is an easier pitch to master since the pitching motion for a change-up is (and really needs to be) exactly the same as you use when throwing the fastball. In fact, throwing it with the same motion is one of the principals behind the pitch. Change-ups are all about deception - making the batter think that a fastball is on the way. The difference is in the grip. Every-thing else remains the same. The change-up can be thrown with a variety of grips, the circle change being the grip of choice. All you have to do is make an OK sign with your thumb and first finger and place the ball snugly in the palm of your hand. Make sure the ball is held farther back in the hand than with your fastball grip. The pressure on the ball is applied with the middle knuckles. Again, this is different from the fastball, where the pressure is light and done by the fingertips. Someone should be able to take the ball from your hand without much effort when youre using the fastball grip. Not so with the change-up. Some kids like using a palm ball grip, which simply means you encase the ball, as much as you can, with all the fingers. Just find the grip that works best for you. Another important aspect of a good change-up, meaning one that stays down in the strike zone, is the follow-through. If your first attempts at throwing the change-up result in the ball bouncing somewhere near the top of the screen, just make sure your follow-through is more complete the next time. For a change-up to be successful, it doesnt necessarily have to result in a swing and a miss for strike three. In fact, a lot of good coaches will say that you dont want to throw a change-up for a strike with less than two strikes in the count. More often, a good change-up gets you one of those hoppers to shortstop for an easy out. Remember, getting the batter to think the fastball is coming is what a change-up is all about! If you can master the fastball, youll be able to get kids out in Little League. Master a second pitch and youll get them out in high school. Master a third pitch (curve, slider, etc. ), and maybe some day youll be able to throw the ball for a living. Developing a good, consistent change-up is a terrific way to extend your baseball future. Just be patient, stick to the basics, and good things will happen. See The Picture Below For The Change-Up Grip ! This may not be much of a surprise to you, since I bet everyone from your parents to your teacher to your baseball coach tells you this all the time: The way to get better at something is to practice it. A lot. But practicing things in baseball might be a little different from practicing other things, like doing your homework. For one, you get to do it outdoors. For another, with baseball, practicing just one thing and one thing only helps you remember the rest of what you need to know. Take fielding a ground ball, for example. Weve already discussed the way to set up to field a grounder (remember how to form your Triangle? See photo below, with the players feet and hands forming the triangle), but sometimes, as you may have found out already, even when you do that, the ball has a way of getting under your glove. But not if you practice getting your glove lower than the ball. The reason keeping your glove lower than the ball as it approaches is a good thing to remember, is that theres always going to be a natural tendency to raise your hands when it comes near. If your glove is at the same level with the ball, chances are pretty good that when you do raise your hands in that natural reflex motion, the balls going to keep on going underneath. Almost every time you see a big leaguer make an error on a ground ball in front of them its because he didnt keep his hands low enough as the ball was bouncing toward him. Another good reason to practice something as simple as keeping your glove lower than the ball is that, when youre really out there playing the infield, repeating it to yourself will be a great way to also remember the other things youve already learned. Remembering your Triangle and everything else weve talked about prepares you for the ground ball as it comes, but keeping your glove lower than the ball helps make sure you catch it when it does.